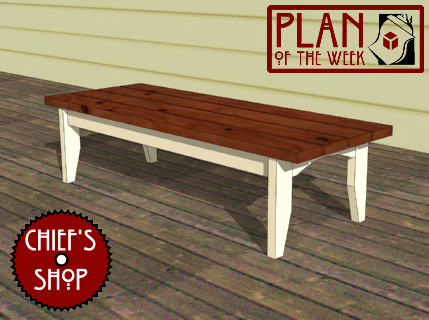 The Chief’s Shop Front Porch Coffee Table, a companion piece to my Front Porch Side Table, can work as both a coffee table and a short bench. Lumber required includes a few 2x4s and 2x6s. Overall dimensions: 63 inches wide x 23 1/2 inches deep x 16 1/2 inches high. You’ll need a table saw with tapering jig (optional), miter saw, jigsaw, drill driver, and Kreg Jig to build it.